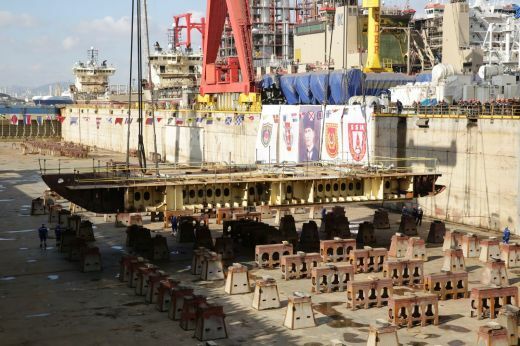 The first keel block of TCG Anadolu was laid on 7th February 2018, nine 21 months after the construction has started. The contract for the construction of the ship was signed in May 2015 after a four year long tender process. The delivery of the ship is scheduled for the year 2021. TCG Anadolu is based on Navatia’s Juan Carlos 1 design. She will be very similar to SPS Juan Carlos 1 in Spanish Navy and HMAS Adelaide and HMAS Canberra in Royal Australian Navy. However, unlike her nears sisters in Spanish and Australian navies, the Turkish ship will only have diesel engines. There will be five MAN 16V32/40 engines each creating 7.680kW and propelling the ship up to 21 knots. The range is estimated to be 9.000 nautical miles. Good news for us and Turkish Navy. However, construction started on 30 April “2016”, so first keel block was laid 21 months after construction has started. I am not an expert but according to the pictures unveiled, it seems like a long period… target commision year is 2021…..